• The UK’s largest ever exhibition focusing on fashion designer Christian Dior and his work opens at the V&A on Saturday. Christian Dior: Designer of Dreams spans his career and legacy from 1947 – the year he hosted his first UK fashion show at the Savoy Hotel in London, to the present day. 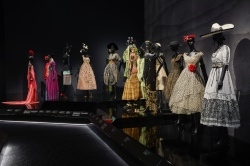 Based on an exhibition shown at the Musée des Arts Décoratifs in Paris, it will also include a section on the world renowned designer’s fascination with British culture. The more than 500 objects on show – revealed in 11 sections – include more than 200 rare haute couture garments as well as accessories, photography, film, perfume and make-up, illustrations, magazines and personal possessions. Alongside gowns worn by the likes of Princess Margaret, Margot Fonteyn and Jennifer Lawrence, highlights include the iconic Bar Suit, given to the V&A by the House of Dior in 1960. Runs until 14th July in The Sainsbury Gallery. Admission charge applies. For more, see www.vam.ac.uk. PICTURE: © Adrien Dirand (V&A). • The work of Sir Don McCullin – regarded as one of Britain’s greatest living photographers and perhaps best known as a photojournalist and war correspondent – is the subject of a new show opening at Tate Britain next Tuesday. Don McCullin features more than 250 photographs dating from the 1950s – when he started documenting the community in his native Finsbury Park – to 2017, when he visited Syria to document the destruction undertaken by the so-called Islamic State. Among the iconic photographs on show are The Guvnors, a portrait of a notorious local gang in Finsbury Park which launched his career as a photojournalist in 1958, Shell-shocked US Marine, The Battle of Hue (1968), Starving Twenty Four Year Old Mother with Child, Biafra (1968), Northern Ireland, The Bogside, Londonderry (1971), and The theatre on the Roman city of Palmyra, partly destroyed by Islamic State fighters (2017). Also on show are photographs depicting the changing social conditions in the UK, landscapes and still lifes as well as the photographer’s magazine spreads, contact sheets, McCullin’s helmet and the Nikon camera which took a bullet for him in Cambodia. Runs until 6th May. Admission charge applies. For more, see www.tate.org.uk.